The image below paints a decent picture of what happened in the quarter. It also indicates how the more mature North American online retail business is now starting to make money. After all those years of growing scale and reinvesting profits, Amazon is finally reaping the rewards. For the full year, the group recorded a whopping $178bn in sales. This showed an increase of 31% from 2016. Net income came in at $3bn which equated to $6.15 a share. It is still not about earnings just yet for Jeff Bezos. Amazon dominates 40% of the US online retail market, but they won't stop there. India, Australia, Europe and South-Eastern Asia are in their sights. Please come to South Africa? Operating cash flow is probably a better number to look at. It came in at a healthy $18.4bn. The AWS division has been incredible for this business. It has a 40% market share of the global cloud business and is extremely profitable. It has allowed Amazon to expand the rest of its businesses even quicker than even they ever expected. The results report included some 2017 highlights. Below are a few that stood out to me. - In 2017, more than five billion items shipped with Prime worldwide. - Fire TV Stick and Echo Dot were the best-selling products in 2017 across all of Amazon. Customers purchased tens of millions of Echo devices last year. 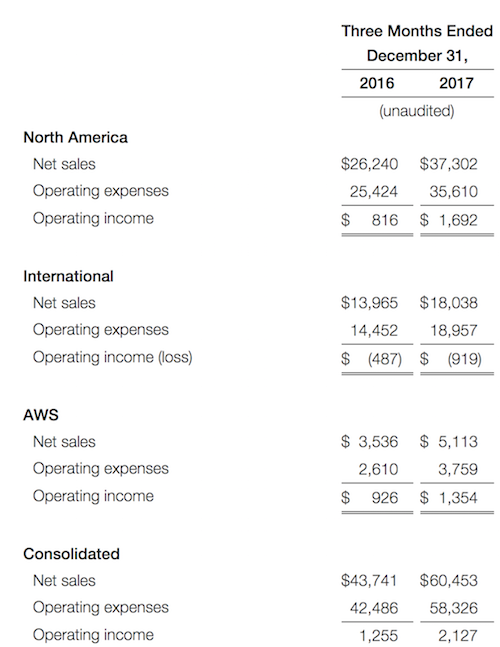 - Amazon hired nearly 130,000 employees globally in 2017, excluding acquisitions. - Amazon announced that the Prime Video app is now available on Apple TV in over 100 countries. Prime members now have more ways to stream award-winning and critically-acclaimed titles, including Amazon Original Movies and Prime Originals. - NFL Thursday Night Football on Amazon Prime Video saw a total of 18.4 million views in 11 games. Prime members in more than 200 countries and territories streamed games on living room devices, including smart TVs and Fire TVs, as well as the Prime Video mobile app and the web. - Amazon acquired the global television rights to The Lord of the Rings, based on the novels by J.R.R. Tolkien, with a multi-season commitment. - Amazon launched two furniture brands: Rivet, offering affordable and versatile mid-century modern furniture ideal for smaller spaces; and Stone & Beam, offering durable and stylish furniture for the modern household. - Amazon Go, a new kind of store with no checkout required, is now open to the public in Seattle. The checkout-free shopping experience is made possible by the same types of technologies used in self-driving cars: computer vision, machine learning, and sensor fusion. - Amazon launched its retail and third-party marketplace offering in Australia with fast delivery on millions of products, including items from thousands of small and medium-sized businesses. - Prime selection in India now offers members more than 25 million local products from third-party sellers. - Amazon Web Services (AWS) announced several enterprise customers during the quarter: Expedia, Ellucian, and DigitalGlobe are going all-in on AWS; The Walt Disney Company and Turner named AWS their preferred public cloud provider; Symantec will leverage AWS as its strategic infrastructure provider for the vast majority of its cloud workloads; Expedia, Intuit, the National Football League (NFL), Capital One, DigitalGlobe, and Cerner announced they've chosen AWS for machine learning and artificial intelligence; and Bristol-Myers Squibb, Honeywell, Experian, FICO, Insitu, LexisNexis, Sysco, Discovery Communications, Dow Jones, and Ubisoft kicked off major new moves to AWS. It is a lot to take in but you get why there is so much excitement and hype around this business. They are growing in the right areas. Still targeting markets in sectors that are coming off a low base. Their scale and expertise allow them to dominate within these sectors. We continue to hold and buy Amazon as a core holding in our portfolios.